← Would you eat a Monkey? 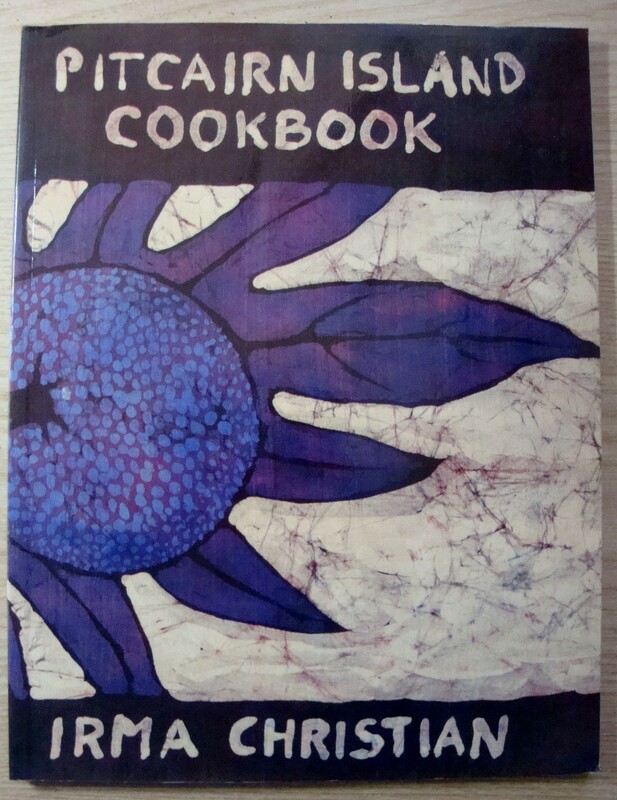 I am fortunate to have located what may be the only cookbook published in Pitcairn Island, ”Pitcairn Island Cookbook”, by Irma Christian. Irma was born and raised on Pitcairn Island and is a descendant of the Bounty mutineers and their Tahitian wives, specifically, Fletcher Christian. In 1789, the British ship “Bounty” was on her way home from Tahiti, when Fletcher Christian decided he could no longer live in close association with the captain, Captain Bligh. Although the plan was to desert the ship, Christian was encouraged to take over the ship, as others had similar complaints about Bligh. Mutiny resulted and Bligh and eighteen loyal officers were cast adrift in the ship’s boat. Christian and his brigade followed earlier accounts of Pitcairn Island, and hence sailed in that direction, arriving at Pitcairn Island in 1790. Pitcairn Island is located between Easter Island and Tahiti. The island supports a variety of fruits and vegetables, including coconuts, bananas, sweet potatoes, breadfruit, pumpkin, arrowroot, yams, cucumbers, cabbage, tomatoes, beetroot and guava, but there are others. With only 2 square miles of arable land, only a portion of that is flat and easily tillable, therefore, gardens are also cultivated on the plateau. “Pumpkin Pilhi” is made from mashed cooked pumpkin, flour, baking powder, sugar and coconut milk and baked for about an hour in a 350-degree oven. “Pilhi” is pureed fruit of some kind and baked in a custard form. There are also recipes for “Sweet Potato Pilhi” and “Breadfruit Pilhi”. Who wouldn’t be fascinated by a recipe entitled “Humpus Bumpus”? Take a cup of mashed bananas, 1 egg, 1 tablespoon of arrowroot flour and spices (your preference), make into patties and fry in some oil. According to Wikipedia, the population of Pitcairn Island was at its peak in 1936, with 250 inhabitants. In the year Irma Christian published her cookbook, 1986, the population was down to 68 and last year, 2012, it had shrunk to 48. Truly, Pitcairn Island reminds me of the popular TV show “Cheers”, “where everybody knows your name”! As for the reason in the population decline, I refer to Irma’s vocabulary at the end of her book: in Pitcairn, “carfoot”, which translates as “don’t know why”. This entry was posted in Cookbooks, Cooking, Cooking and Social History, Eating, Recipes and tagged British History, cookbooks, Cooking, Fletcher Christian, food history, Irma Christian, Munity on the Bounty, Pilhi, Pitcairn Island, social history, time capsules. Bookmark the permalink. 3 Responses to Just in Time for Fall: Pumpkin Pilhi from Pitcairn Island! Wow…how fascinating to have been in touch with her. How did that happen….did you have copy of her cookbook? Thanks for reading and commenting on the post! I talked with Irma on hamradio and also with Tom..I heard that Irma moved back to Newzealand..It was fun…My call KA1LWR..Gene at the time I lived in Fairfiled Maine…I am now in Oakland Maine..